What do the London Science Museum, New World Symphony, and the National Park Service have in common? They are all fighting for relevance in an often indifferent world. 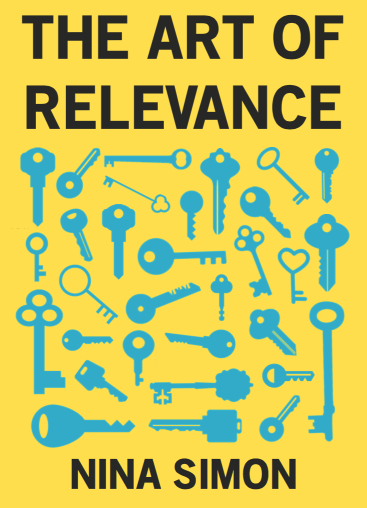 The Art of Relevance explores how mission-driven organizations can matter more to more people. The book is packed with inspiring examples, rags-to-relevance case studies, research-based frameworks, and practical advice on how your work can be more vital to your community. Whether you work in museums or libraries, parks or theaters, churches or afterschool programs, relevance can work for you. Relevance is not something an institution can assign by fiat. Your work matters when it matters to people—when THEY deem it relevant, not you. The Art of Relevance will help you identify the people you seek to engage, empathize with their concerns and interests, and develop authentic ways to invite them into your work on their own terms. The Art of Relevance is organized into five sections and about a million short chapters. The sections cover the definition of relevance, the differences between insiders and outsiders, building relevance to specific communities, tying relevance to institutional missions, and measuring and deepening relevance. Check out the full table of contents and read a sample chapter to learn more. NINA SIMON has been described as a “museum visionary” by Smithsonian Magazine for her audience-centered approach to design. She is the Executive Director of the Santa Cruz Museum of Art & History, and has consulted with hundreds of international museums, libraries, parks, historic sites, art and cultural centers on issues of relevance, community engagement, and participatory design. Nina is the author of the best-selling book The Participatory Museum and the popular Museum 2.0 blog. Her work has been shared in the Wall Street Journal, New York Times, NPR, and TEDx. She lives off the grid in the Santa Cruz mountains with fourteen people, twenty-seven chickens, five dogs, and one zipline. Special thanks to the James Irvine Foundation for financial support of this project, Elise Granata for her incredible design work, and Jon Moscone for writing a powerful preface.